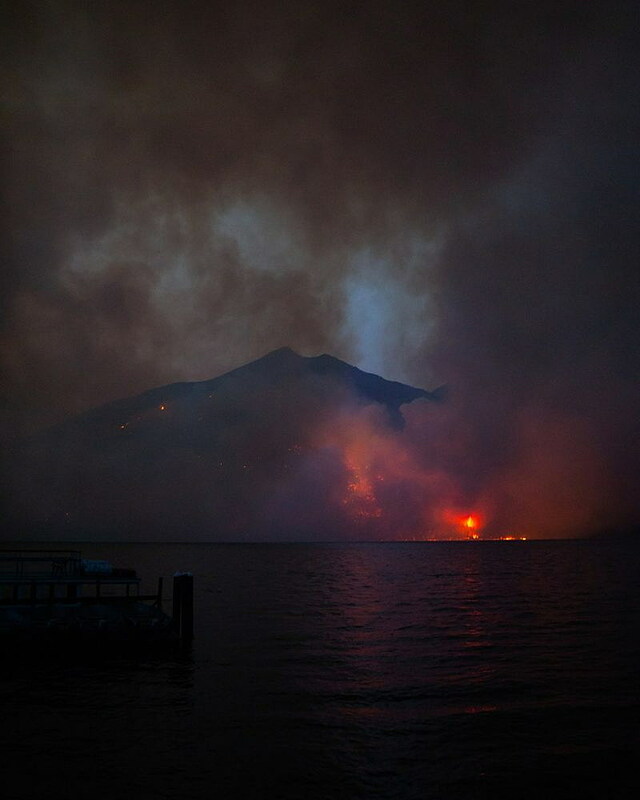 The Howe Ridge fire continues to grow – by day and night – around Glacier National Park’s iconic Lake McDonald. On Thursday, park officials said the fire has now been mapped at 3,500 acres and is actively burning to the southwest and northwest – spotting ahead of the flame front as it advances. Two helicopters, a K-Max Type 1 and a Huey Type 2, worked the fire’s leading edges all Wednesday afternoon and evening, intent on slowing the growth. Other aircraft could not approach the fire because of low visibility, according to Lauren Alley, a Glacier Park information officer. Even with the water drops, the fire burned actively through the night, Alley said Thursday morning. Firefighters reported single-tree torching, spotting and growth to the southwest, as well as on the southern slopes of Mount Stanton and to the northwest toward Rogers Lake. The wild card on Thursday is an anticipated change in the weather, with the existing ridge of high pressure breaking down and winds changing direction. Alley’s report said the weather change could push the fire to the southwest and northeast. Ground and structural protection crews continue to work at the north end of Lake McDonald, protecting dozens of private and public structures, Alley said. Just 78 firefighters are assigned to Howe Ridge. Aircraft will be used to control the fire’s spread with water drops, if wind and visibility allow. Nearly a week after it was ignited by a lightning storm, the Howe Ridge fire will be placed under the management of a Type 1 incident management team on Friday. Incident commander John Pierson’s Southwest Area team is in Glacier and will take over at 6 a.m. 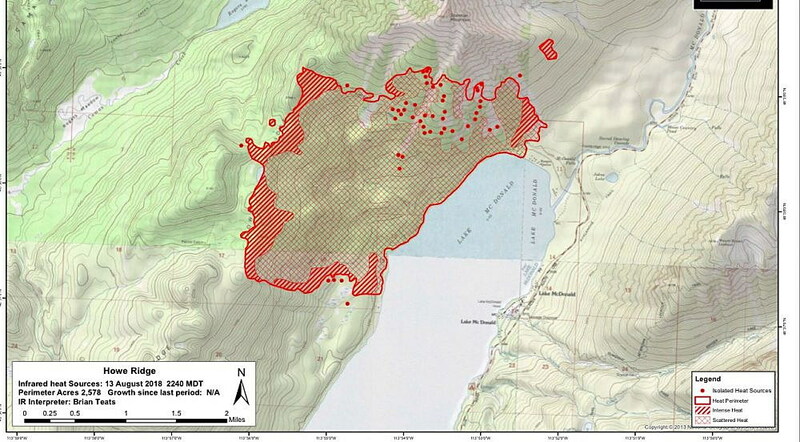 The fire burned more than a dozen historic structures on the northwest end of Lake McDonald during a wind-driven run from 20 acres to 2,500 on Sunday night. Many of those were at Kelly’s Camp and predated Glacier Park’s designation. Some property owners have been allowed back into the area off North Lake McDonald Road, but only for a short while on Wednesday, Alley said. Other properties along the road remain too dangerous to access. All remain under an evacuation order. Many areas on Glacier Park’s west side remain evacuated and closed, including Lake McDonald Lodge and all associated buildings, Avalanche and Sprague campgrounds, all private residences on North Lake McDonald Road and Going-to-the-Sun Road and the Lake McDonald Ranger Station. In addition, Going-to-the-Sun Road is closed from the foot of Lake McDonald near Apgar to Logan Pass. The pass can be accessed only from the eastern entrance at St. Mary. Also, the Inside North Fork Road is closed and multiple trails are closed because of the Howe Ridge fire. The full list of trail closures is available on the park’s website. Stage 2 fire restrictions are now in effect in Glacier Park – and most of western Montana – because of the extreme fire danger. That means: No campfires in Glacier’s front country or backcountry. No smoking except inside an enclosed building, vehicle, developed recreation area, or bare area that’s at least 3 feet in diameter. Propane stoves that have an on/off switch are permitted. Visitors and would-be visitors who have additional questions can call Glacier Park’s fire information line at 406-888-7077. Recorded information is available if a fire information officer is not available to answer the phone. Elsewhere, in Essex, a few homes have been placed on an evacuation warning, a precaution so residents are prepared for any eventual mandatory leave-taking, because of the 400-acre Paola Ridge fire. That warning was issued Thursday morning by the Flathead County sheriff.